According to a revision announced by the TTB, King Estate is now within the Willamette Valley AVA. Eugene, Ore.—The addition of 18,560 acres to the Willamette Valley AVA may be a small step for the region, but it marks the giant stride Oregon’s wine industry has taken since 1983. King Estate Winery petitioned for the adjustment with the support of its neighbor, Iris Vineyards. The amendment, announced March 3, brings them both within the ambit of the Willamette Valley AVA, established in 1983 in large measure thanks to the efforts of David Adelsheim, founder of Adelsheim Vineyard. “Our north property line basically abutted the AVA original line, and we were aware, of course, for 25 years that we weren’t in the Willamette Valley AVA,” explained Ed King, co-founder and CEO of King Estate. While the winery has more than 1,000 acres of vineyard, it sourced most of its grapes from the Willamette Valley. King estimates that the 400,000-case winery buys approximately 10% of the state’s crop each year. Consequently, King Estate tacked its flag to the mast of Oregon rather than the Willamette Valley, even though the levies it paid supported the Willamette wineries’ association. A new label bearing the Willamette name is being rolled out to mark the change, which in many respects simply shifts the winery’s identity to a more specific patch of dirt. Yet some variation is to be expected. The Willamette Valley is a big appellation, running 120 miles north to south and 60 miles side to side and containing six sub-appellations. The latest winery and vineyard census conducted by the Southern Oregon University Research Center found a total of 694 vineyards producing close to three-quarters of the state’s grapes. The approval is the first change to existing AVAs in Oregon since the establishment of the Rocks of Milton-Freewater AVA in February 2015 (see “Wine on the Rocks”). 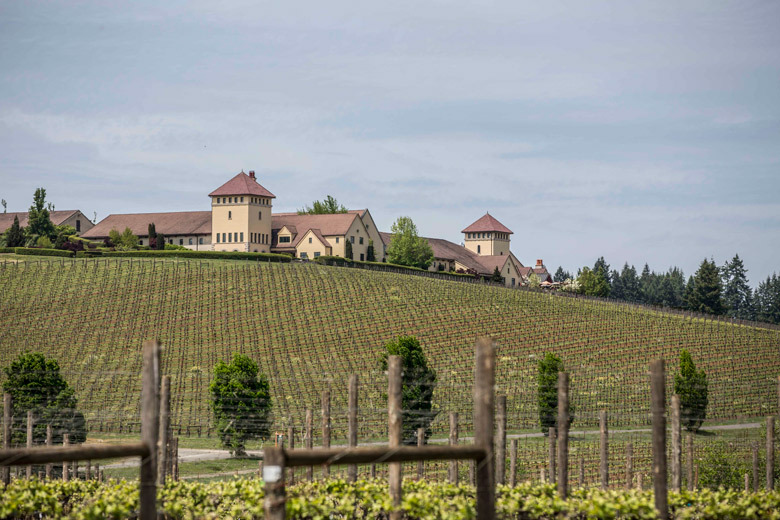 Sue Horstmann, executive director of the Willamette Valley Wineries Association, welcomed the change, noting that the size and location of King Estate promises to raise the profile of surrounding wineries, too. King Estate will debut as a full-fledged member of the Willamette Valley Wineries Association at the association’s inaugural Pinot Noir Barrel Auction on April 2, 2016—an event that coincides with the 50th anniversary of the Oregon wine sector. The expansion of the Willamette is one of several AVA processes under way in Oregon. Other initiatives include Maria Ponzi’s pursuit of an appellation defined by the Laurelwood soil type, a variety of loess common in the Chehalem Mountains, and preliminary work toward an AVA in the Monmouth area spearheaded by Jackson Family Wines. The petition furthest down the pike is a proposal for the Van Duzer Corridor AVA, an initiative that began in 2012. A petition was submitted in July 2015 and accepted, but it has yet to be released for comment. Flo Merlier, winemaker at Van Duzer Vineyards in Dallas, Ore., believes it could be approved by early 2017. The proposed AVA is approximately 36 square miles (or 23,000 acres) and includes 16 vineyards and seven wineries. By the same token, in relatively cool vintages such as 2010 and 2011, the influx of coastal air has delivered some much-needed warmth. The diversity within the AVA is a point of pride for Horstmann, who said it allows the Willamette to offer more than what some might think at first glance. This in turn gives consumers plenty to discover.